Media Release: Having spent the early years of his career working with the man who was globally renowned for the role he played in growing the game of golf, Sentosa Golf Club’s Andrew Johnston has a special appreciation for this week’s Asia-Pacific Amateur Championship (AAC). Johnston wears several hats at the club – he not only redesigned the two courses (Serapong and the New Tanjong), he is also the General Manager and the Director of Agronomy here. The New Tanjong course will be the host venue of the 10th edition of the AAC, the premier amateur golf tournament of the region, which will be played from October 4-7. 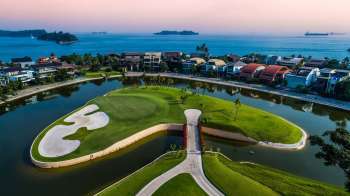 Johnston has been living in Singapore since 2009, after earlier stints in various parts of the world, including nine years as a Project Manager with Arnold Palmer Golf Course Design when he helped ‘The King’ create 90 of his masterpieces. Like most people who have been influenced by Palmer, the 54-year-old from Jupiter, Fla., is in awe of the seven-time major champion, a list that includes four Masters and The Open on two occasions. Johnston realizes that a championship as prestigious as the AAC requires a stage that will provide all the drama and excitement and felt that his mentor would have approved of what his team has prepared for the elite field featuring the region’s top 120 players from 39 countries. “Growing the game of golf was Arnold’s life-long mission and he did it in his own inimitable way. I feel that is what the AAC does for our region,” said Johnston. “I had this dream to be a golf course architect since I was 14 and working with him and his team was life-changing. Arnold had these rules of thumb about golf course design and life that live with me today. His philosophies changed how I think. I have never ever met a man quite like him again. “As we host this tournament, I feel so proud. I think he is looking down on us today and smiling. I can feel him patting me on the back. Tournaments like these meant more to him than anything else. Johnston said the course will be ready to provide any kind of challenge that the Tournament Director has in his mind for the players. “The Tournament Director is the key on how hard or soft he wants to set up the golf course. Our job is to provide a facility that is in perfect conditioning and allows him to play it out the way he wants to,” said Johnston. “We have prepared the course the same way we’d prepare for a $7 million Singapore Open. We started preparing for this nearly six months ago with a fertility plan guiding it to this week. I am sure when it is challenged this week, it will not just feel like a professional event, it will also play like a professional event. Johnston feels the key to becoming the AAC champion come Sunday would be in having a sound plan for the golf course and the ability to master the greens. “The biggest challenge are the greens. They are all redan shaped and designed like they are up in the air with false fronts, backs and sides. They are not steep in contours, but they have subtle movements and you have to be really good at reading those,” he added. The Asia-Pacific Amateur Championship, which is now one of the five ‘Elite’ events on the World Amateur Golf Ranking, is supported by six Proud Partners – AT&T, 3M, Mercedes-Benz, Samsung, Delta and UPS – and two Scoring Partners, Rolex and IBM. The AAC champion earns an invitation to the Masters Tournament at Augusta National Golf Club and a place in The 148th Open at Royal Portrush in 2019, provided he retains his amateur status. The runner(s)-up will gain a spot in The Open Qualifying Series. The 72-hole stroke play event at Sentosa promises to be a real festival of golf in a special year for the championship, which has been a springboard for players such as two-time champion Hideki Matsuyama of Japan (2010 and 2011), China’s Guan Tianlang (2012 winner who went on to become the youngest ever to make the cut at the Masters) and the promising Australian Curtis Luck (2016).